Apostle Claver T. Kamau-Imani, is the founder and chairman of RagingElephants. org - a non-profit issues-oriented organization dedicated to growing the conservative voting base primarily through racial diversity. Apostle Claver Kamau-Imani is a dynamic speaker who has traveled the country giving workshops on voter education and citizen activism. His work with the Tea Parties as well as other conservative groups has enabled them to confront the racial stereotypes being charged against conservatives. A born-again Christian, Apostle Claver Kamau-Imani is the founder and senior pastor of the Corinthian Christian Empowerment Center (CCEC) in Houston. Apostle Claver is a graduate of Lamar University with a B.S. in mass communications. Claver has years of experience as an announcer and producer on both Christian and secular radio. Apostle Claver, a 5th generation Texan, grew up in Beaumont within a home of Christ, politics and civil rights. Both of his parents were active leaders in Democratic Party politics, civil rights, community activism, education, charity, and the Missionary Baptist Church. 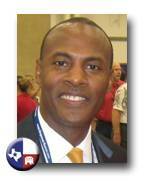 Currently, Apostle Claver is a member of the Republican Party, a director for the Greater Houston Pachyderm Club, a member of several other conservative-leaning clubs and organizations.